Angus was adopted by Der Au when he was just 10 weeks old. She knew that Angus was for her the first time she saw him. Der Au also knew as soon as she adopted him that she was going to need help. She had adopted a Great Dane in the past, but that dog was already an adult and very well-behaved when she came into Der Au’s life. With 10-week-old Angus, she was entering new territory. She reached out to 2SpeakDog for guidance and was lucky to have trainers Kasey Herrera and Jennifer Kyzer come to her house within two days of bringing him home. That was the beginning of Der Au’s long, wonderful relationship with 2SpeakDog. She made sure to enroll Angus in any and all classes that they offered. 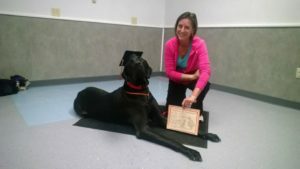 He was the first pup to complete and pass multiple classes and was part of the first class to receive his American Kennel Club (AKC) Community Canine title. At just eight months old, Angus passed all his classes and graduated as a Canine Good Citizen. From there, Der Au made sure Angus was out and about as much as possible. 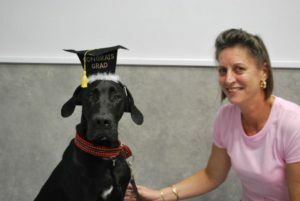 He continued training at 2SpeakDog and even assisted the trainers by serving as a mentor for the other pups at the facility. Angus was not only smart, he was loyal, lovable, always willing to please, eager, gentle, protective, and large – his nickname was “Moose” after all! Then, a week before Thanksgiving 2016, Angus started showing signs that something wasn’t right. He didn’t want to eat, despite still acting like his playful, usual self. Der Au suspected that Angus ate something he shouldn’t have, so she took him to his veterinarian. After an exam and x-rays, Angus’ vet was stumped too. Like Der Au, he also brought up the possibility that Angus ate something. Because they weren’t sure what was coming across on the x-ray, they didn’t want to perform surgery right away. They gave Angus some medicine to try and resolve the issue, but it didn’t work as they had hoped. He continued to not be able to eat, and Der Au knew something was very wrong. Even though his energy and demeanor were the same, the fact that he wasn’t eating meant that this wasn’t a sustainable situation. Per the doctor’s instructions, Der Au took Angus back a week after his initial appointment. An ultrasound showed something on Angus’ spleen – a tumor. The doctor wanted to take Angus into an emergency surgery, given that spleen tumors are incredibly dangerous and can cause the organ to explode. That evening during surgery, Angus’ veterinarian removed a 4.5 lb. tumor about the size of a football. Following the surgery, Der Au took Angus to the emergency vet for an overnight stay and post-op care. Finally, in late December, Der Au learned that Angus had stromal sarcoma, which is a type of cancer seen in less than 5% of animals. After meeting with an oncologist, the doctor explained that this form of cancer is extremely aggressive. Der Au was told that she had, at most, a few months left with her boy. Der Au contemplated all her options after learning Angus’ horrible diagnosis. Treatment wasn’t an option and she did not want to prolong his suffering, so she let him live the best life she could over the next few months. During their time together, Angus taught and gave so much to Der Au. She made sure to do the same for him too. 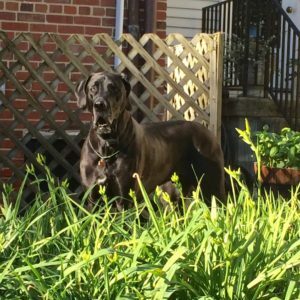 Four months and two days after his surgery, Angus passed. Angus’ memory lives on in the mission of FETCH a Cure, which works to educate and provide financial assistance to families whose dog or cat has been diagnosed with cancer. As part of the nonprofit’s 2018 Mutt Strutt Pet Cancer Awareness Walk, we will walk in memory of Angus and all of the other beloved pets lost to this disease. Working with the community, FETCH can provide hope and options in the face of a cancer diagnosis. Together, we can save more best friends’ lives. If you would like to purchase tickets to the 2018 Mutt Strutt Pet Cancer Awareness Walk, please click here. You don’t have to be local or attend the event to help pets in need. Share your story and start your personal fundraising page or join a fundraising team by clicking here. Every dollar raised will go on to support pets battling cancer in Virginia, Maryland and DC. Thank you for helping people and pets in our community.